If things go wrong, a good pair of motorcycle boots can make the difference between terrible damage and no damage at all to your feet, ankles or shins. Of course when you go for a ride, a good pair of heavy leather work boots is better than a pair of sneakers. But only boots made specifically for motorcycle riding can give you the necessary combination of toe, ankle, heel and shin protection you really need. So, please, when you choose a pair of motorcycle riding boots, choose wisely. 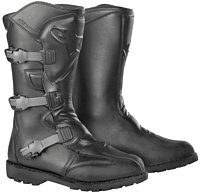 Motorcycle riding boot designs, features and capabilities overlap quite a bit to give you a huge variety of combinations. As a group, touring/commuting/street boots are probably the most diverse and versatile. They're form-fitting and comfortable and give you ample protection around the most vulnerable, high impact areas of your feet ankles and shins. They're best suited to streets and highways -- not race tracks or off-road riding. You can find designs suitable for short trips, long treks and all kinds of weather -- including cold and rain. 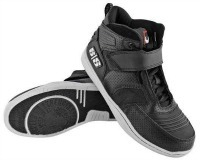 You can also find designs that have ankle flex zones and pliable soles that make walking easier than in stiffer boots. Touring/commuting/street boots are usually 10- to 14-inches high, although some are much shorter and very appropriate for off-bike wear. Look for boots that have extra material where the shifter lever rubs against the toe of your boot. Without it, the shifter will eventually wear through the leather. Like most motorcycle riding boots, these are made from combinations of leather, metal, rubber, plastics and high-tech, waterproof fabrics. Most designs don't include laces that can become untied or snag on your bike's gear shifter, brake pedal or other frame parts. Thanks to a side-entry zipper extending from the boot top to below your ankle, they're easy to pull on or off and to secure. Typically, a Velcro-fixed leather flap protects the zipper and keeps the water out. Some boots have an internal quick-lacing system that ensures a snug, comfortable fit. If you enjoy blasting along dirt trails and rough roads, you should be wearing a sturdy pair of highly specialized motocross/off-road motorcycle riding boots. 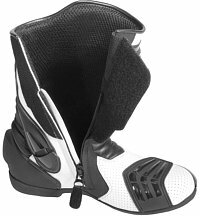 They're about knee-high and made of leather, metal, high-tech composites and plastics combined to give you a snug, form-fitting, very protective boot. Most off-road boots have a metal plate screwed to the sole to protect it from rocks and rugged trails. Composite or plastic plates protect your shins from tree branches and other obstacles along the trail. They also deflect rocks and other debris launched by your bike's front wheel. 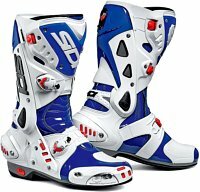 The boots' overall stiffness, steel soles and forward-angled uppers that favor the motocross riding position make them uncomfortable for most off-bike wear. The boots' tall uppers open lengthwise to make it easy for you to pull them on or off. 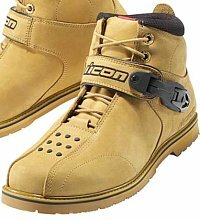 You secure each boot and make it comfortable by locking down four or five adjustable straps along the foot, ankle and upper portion. 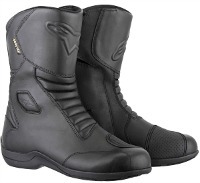 Similar to heavy-duty motorcycle touring boots, some motocross/off-road boots have an internal quick-lacing system that gives you a firm, comfortable fit. Racing boots have relatively smooth soles that help you to feel and operate your bike's foot controls. And they give you more armor protection on impact-prone areas than you'll find on other boots. They also have replaceable toe sliders -- and often heel sliders -- that take the abuse of deep cornering. You can replace just about every part and protective attachment on racing boots. That's important because racing boot parts wear out after constant contact with the track or can be destroyed if you have an accident. You may choose a pair of black racing boots, or you might opt for an eye-catching color combination that matches your bike or riding outfit or simply because it looks cool. 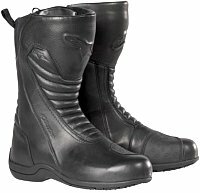 More than other types of motorcycle riding boots, cruiser boots are built for comfort, style and easy riding. 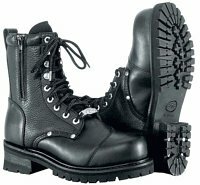 Many cruiser boots resemble other types of sturdy footgear such as thick soled work boots, engineer boots, military boots and western style harness boots. And, in general, cruiser boot designs offer less overall padding and protection than other styles. However, there's ample variety in cruiser boots to give you a wide choice of designs to suite your riding style and requirements. Your boots should feel comfortable the second you pull them on. 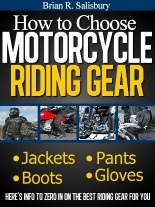 True, some motorcycle boots -- particularly heavy-duty touring boots and motocross boots -- may need some breaking in. But, once you've accomplished that chore, your boots should be a pleasure to wear. If you like to walk around a bit during your motorcycle trips, or you'd rather keep your boots on after commuting to work, you should choose boots that are comfortable for walking as well as riding. By keeping you comfortable and matching your riding style and habits, your riding boots will help you to stay safe and alert. Most motorcycle riding boots have closures and fasteners -- not laces -- that stay secure and prevent your boots from coming off if they're dragged along the road. Your boots should give you a firm, non-slip grip on your bike's foot pegs and let you feel and operate your motorcycle's rear brake and gear shifter easily. They should give you solid traction when you put your foot down at a stop light or push your motorcycle out of the garage. Whether you're an all-weather, four-season road warrior or you prefer taking short rides around town in pleasant weather, your boots should suit the range of riding conditions you normally encounter. Such conditions could include long hours in the saddle, drenching rain, hot sun, cold winds or rugged roads. If your motorcycle jaunts often include a reasonable amount of walking, your boots should accommodate your off-bike requirements. By meeting the demands of your riding style and habits, your riding boots will help you to stay alert and safe. With so much depending on your motorcycle riding boots, it's best to consider all options when determining which type of boots will keep you most comfortable, provide the protection and control you need and best suit the way you ride. And it's understandable if you want boots that look good and make you look good, too. Do the boots at least cover and protect your ankles? Do they have extra material or a shifter pad where your bike's gear-change lever or other controls continually rub your boot? 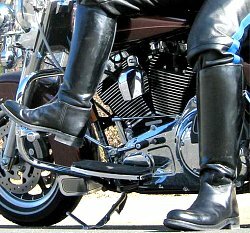 Your boots should have heels -- even if they're low -- so you can rest easy on the foot pegs and get enough leverage to operate your bike's foot controls. Your boots should support your ankles and shins, and have shielding to protect these areas. If your boots have sliders for deep cornering, are they securely fastened? And can you get new ones easily when these wear out? Your soles should flex lengthways for walking but remain rigid width-ways to protect your feet if your bike falls on them. If you're considering riding boots with laces, make sure the laces are protected or located so they won't snag on your bike's gear shifter or anywhere else. Water resistant boots lined with Gore-Tex or another waterproof, breathable fiber -- or made with waterproofed leather -- are your best bet. Look for boots that have double stitched kevlar-thread seams. Look for boots that have hardened toes. Look for properly ventilated boots that won't roast your feet in hot weather or when you're riding hard. Boots with Gore-Tex vents are a good choice. Make sure your boots give you the versatility and flexibility you need if you plan to wear them for walking or for long periods when you're not riding. Finally, before you buy a particular pair of boots, make sure they feel right when you're on your motorcycle or sitting on a bike that simulates your normal riding position. Do the boots pinch your feet or chafe your legs. If you're still satisfied with how they feel and perform, then they're the motorcycle riding boots for you. I recently replaced the Gore-Tex-lined Alpinestars boots I'd been wearing for nearly 15 years. During that time I had them resoled once and had them patched and otherwise tuned-up a bit. 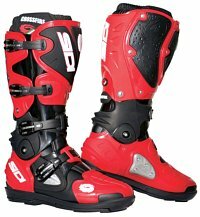 The new boots I selected are these Alpinestars Web Gore-Tex boots. In addition to providing crash protection, they protect me from rain and harsh weather when touring or commuting.